This ESG Lab Validation documents the hands-on testing of HP VirtualSystem for VMware 2.0, optimized for VMware vSphere 5. HP VirtualSystem is designed to provide holistic management for both physical components and virtual environments. 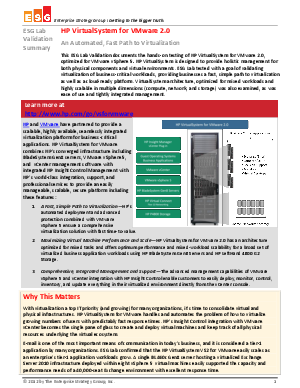 ESG Lab tested with a goal of validating virtualization of business-critical workloads, providing businesses a fast, simple path to virtualization as well as a cloud-ready platform. HP VirtualSystem architecture, optimized for mixed workloads and highly scalable in multiple dimensions (compute, network, and storage) was also examined, as was ease of use and tightly integrated management.